Will Russia be affordable for Russians after the presidential elections? As Russia’s presidential elections draw closer, predictions and promises of low inflation made by top Russian officials are getting rosier, despite many economists expressing "serious reservations." Buoyed by the combination of low unemployment and record-low inflation last year, officials said they have now chalked out a plan to keep inflation from spiraling up on the back of lavish pre-election spending. At the just-concluded Russia Forum 2012, Russian policy makers, from the prime minister downward, piously proclaimed the government’s determination to keep consumer prices at record-low levels while maintaining moderately high growth rates in 2012. Russian Prime Minister and presidential hopeful Vladimir Putin told Russia Forum 2012 participants on Thursday that Russia finished off 2011 with a good economic outcome, despite volatile global economic conditions. Putin, who has never missed a chance to tout his government’s economic record ahead of the elections, said Russia was able to show off a four-percent GDP growth and a record low inflation rate of 6.1 percent, compared to the past two decades. His government, he said, will work to further reduce consumer prices in order to make life affordable, especially for millions of Russian citizens on low pensions. To the prime minister’s credit, the inflation rate in Russia was last reported at 6.1 percent in December of 2011, but annualized price growth softened further at the start of 2012, falling to 4.1 percent as of January 30. However, economists have attributed the current low prices on goods and services to a government decision last year to postpone planned increases in regulated prices and tariffs until July 1, 2012. In Russia, the government annually set the tariffs for housing-communal services like heating, water and sewerage. The tariff-setting procedures are highly politicized, and in times of rising inflation tariff increases are used as a kind of shock absorber to cushion the full impact of inflation on the population. The government conceded as much last year, saying it was delaying the measure because prices and tariffs, which are traditionally increased at the beginning of every year, may somewhat accelerate inflation. Despite such a backdrop, Economic Development Minister Elvira Nabiullina joined in the chorus on Friday by forecasting that basic goods and services may cost less this year, as her ministry tries to meet the government's inflation target, which officially stands at five to 5.5 percent in 2012. In an optimistic note, she said the government’s decision to delay increases in prices and tariffs will only allow tariff increases to coincide with the seasonal decline in prices and put downward pressure on consumer prices. "I think that they will balance each other out in the months to come," Nabiullina told the forum’s participants. "We do not expect a big spike in short-term inflation." Many economists interviewed by Russia Profile said putting off prices and tariffs increases till mid-year is like a ticking economic time bomb capable of doing a great deal of harm to consumers after the elections. While the measure has largely helped to hold down the overall increase in current consumer prices, it can potentially exacerbate the upward spiral in consumer prices in the second half of this year, said Natalya Volchkova, a macroeconomics professor at the New Economic School. "Two factors have helped keep inflation low: an unprecedented decline in food prices last year and the delay in planned increases in prices and tariffs,” Volchkova said. "We may have simply deferred the problem because the inflationary pressure we suppressed last year will pick up speed in 2012." Valery Mironov from the Higher School of Economics' Center for Development said the government should not count on another steep decline in food prices to absorb the inflationary pressure, as was the case last year. "After a spell of high food prices in 2010, prices dropped 25 percent in 2011. This shaved off a full percentage point on the rate of inflation," Mironov said. "Considering the harsh winter this year, one can expect a poor harvest leading to bigger-than-expected price increases." 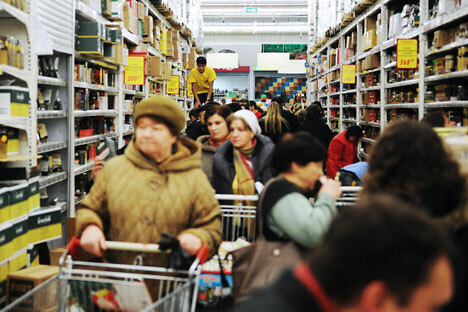 UralSib Chief Economist Alexei Devyatov said state officials have held down, but not stopped imminent price increases. In addition to the recent increase in money supply, traditional price indexes will be pegged at ten to 15 percent in July, and that is bound to impact inflation, he said. "The rosy forecast by the Economic Development Ministry is unlikely to hold true," Devyatov said. "We expect inflation to hover around 7.2 percent this year, which is still historically low."